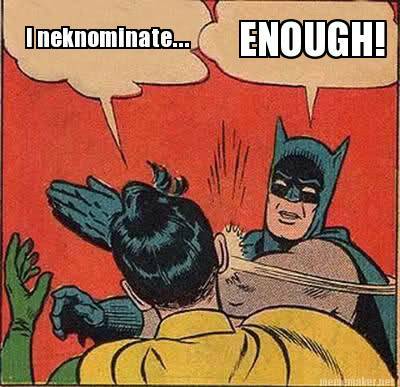 Many of you by now will have heard of Neknominate, and if not, trust me, you soon will, probably proceeded by a bow wave of growing social outrage and phrases such as ‘dangers of social media’ and ‘culture of binge drinking,’ all in close succession. For those who haven’t, Neknominate or Neck and Nominate is a drinking game generally credited with having been started by an English Rugby star. Rugby for those of you unaware is a sport much like American Football only played without the benefit of armour and seven figure salaries. It began simply enough. A person drinks, what began as a pint of beer, generally in one go, then uploads footage to the web and nominates two other people to do the same within 24 hours. Amusingly stupid perhaps, but hardly shocking. I for one did worse at college. People took to the idea, as they have a tendency to do in a world where you can post the amusing wedding video of you rocking out to Baby Got Back at 10am and have people in Kazakhstan laughing at it by 11am. Before long however the game, for want of a better word, began to evolve. Next it became where or how the drink was drunk, with people attempting to outdo their nominator. This led to footage of, amongst other things, a cute girl dropping her dress in a supermarket, and a guy pausing at the counter at McDonald’s for a cold one. Some of this footage was amusing, others deeply sad, but then that describes half of what you find on social media these days. Unfortunately, like a game of Chinese Whispers, it began to evolve once again, and like Chinese Whispers the further you got from the start, the more people began to miss the point, if there ever was one to begin with. It became ever more about the ability to shock. Subsequent nominees, lacking the imagination to do different instead chose to do more. One man filmed himself drinking two pints of gin. He died shortly after and the wolf cry of social outrage and disapproval began to howl across the land once again. Three more have died since. More will probably follow no doubt. What began as a churlish, mildly amusing game has spiraled out of control and now people are suggesting government intervention, as people have a want to do, with some police forces even threatening to prosecute anyone who nominates someone who then subsequently dies. Others are using it, as some like to do, to bludgeon alcohol and the alcohol industry as a whole around the head. It’s convenient to blame it all on the ‘emerging culture of binge drinking.’ However I worked in bars for fifteen years and I would say 95% of our culture drink perfectly well and perfectly safely. Even the remaining 5% hardly count as emerging. As long as there has been alcohol there have been people unable to self regulate it. Gin Madness in London in the 1720’s killed thousands, nay hundreds of thousands, with watering holes advertising ‘a drink for a penny and a straw for free’, meaning if you bought a drink you could sleep where you fell. At best what we are experiencing is an ‘emerging culture of being able to see the binge drinking on Youtube’. People are dead and that is a tragedy, but to those suggesting some kind of government involvement, I say get a grip. This is nothing more than the latest monster hiding in the cultural woodshed and not even a particularly scary one at that. Alcohol is already one of the most regulated vices in the world, and to the best of my knowledge not a single case of Neknomination has happened in a bar, or in the presence of a professional bartender. It is indeed happening right now out there in the world, but we cannot stop that. The last time a Government tried we got Prohibition, and we all know how well that turned out. Do you have an opinion? Tell us below or via twitter @bezerkskhaus. Previous Previous post: Drinking Tech: Ultimate Inventions for a Good Night out.